Take a few moments to browse our store. We have a handful of Catholics Come Home exclusive items and a large library of recommended resources. 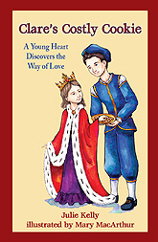 In Catholics Come Home Manager of Communication and Evangelization Katie Peterson Warner’s first book, with a foreword by Bishop James Conley of Lincoln, Neb., she provides men and women with approachable catechesis, practical strategies, inspiring stories, and excellent resources to integrate the Catholic faith more intentionally into family life. 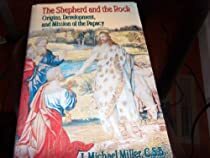 The book was written for individual use at home or for use in dioceses and parishes, marriage ministries and marriage preparation, adult faith formation, men’s and women’s groups and book studies, and for supplemental formation of parents whose children are in Catholic schools. 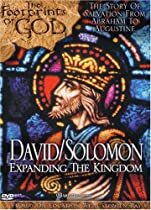 The home is truly the epicenter of evangelization, and if more families were focused on the characteristics of strong spiritual leadership that are outlined in this book, we would experience a lot fewer Catholics leaving the Church and a major resurgence of energy in our parishes and throughout the entire Church. Head & Heart has received endorsements from Dr. Scott Hahn, Jeff Cavins, Dr. Edward Sri, Bishop Thomas Olmsted, Bishop Sam Jacobs, Patrick Coffin, Steve Ray, and a number of other lay Catholic evangelists, priests and bishops. 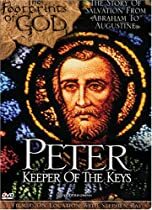 Make sure this book is in your home and at your parish. 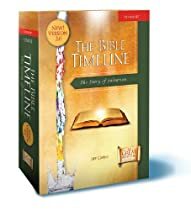 With this resource, men and women can learn how to become the spiritual “heads and hearts” that God created them to be. Perhaps there is no greater gift we can give our children than the gift of our prayers. As parents we, almost without thinking, nourish their bodies and their minds throughout our daily activities with them, but it is in praying fervently for our children that we can help the life of grace flourish within their souls, aiding God in transforming them into the children He desires them to be. Sometimes life happens, and we aren’t as intentional about praying for our children as we would like to be. Allow this simple prayer guide and journal to give you the motivation and tools you need to make praying for your children a priority this year—and always. A single journal can be used to pray for all of your children or multiple can be purchased so you can devote one journal for each child. It is also designed to be gifted to the child, if the parent chooses to, or it can remain a private prayer diary for the parent. Perhaps there is no greater gift we can give our grandchildren than the gift of our prayers. As grandparents we can help the life of grace flourish within their souls in praying fervently for them, aiding God in transforming them into the persons He desires them to be. Prayer is powerful. We marvel at how the prayers of Saint Monica, mother of her wayward son, Augustine, worked in conjunction with the Holy Spirit to bring him back to the ways of the Lord and put him on the road to sainthood. We treasure the witness of Saints Louis and Zelie Martin, parents of Saint Therese of Lisieux, who lived their lives as a prayer to God and passionately prayed for their daughters, who all entered the religious life and lived extraordinarily faithful lives. A single journal can be used to pray for all of your grandchildren or multiple can be purchased so you can devote one journal for each grandchild. It is also designed to be gifted to the grandchild, if the grandparent chooses to, or it can remain a private prayer diary for the grandparent. Season 2 of Catholics Come Home television series, DVD set of 4. Over 6 hours, containing all 12 episodes of season 2 of “Catholics Come Home” the TV series! Features amazing stories of atheists, agnostics, converts and reverts who all came home to Jesus and His Catholic Church after witnessing a Catholics Come Home evangomercial TM. Also contains several teachings on the new evangelization and faith topics for families and parish use, in each episode. Season 3 of Catholics Come Home television series, DVD set. After being diagnosed with a fatal nerve disease, Jeff Van Brunt was told he only had a few years left to spend with his wife and children. Two years later, this courageous father of four shares his story with Host Tom Peterson about how he learned to trust in God’s plan, despite his illness. Join EWTN Home Video for a Special Presentation of Catholics Come Home and witness one man’s incredible journey and his Trustful Surrender to God. Suggestion donation for posters is $10 each, includes shipping. Now shipped in a protective tube! Please contact us for a large quantity discount. 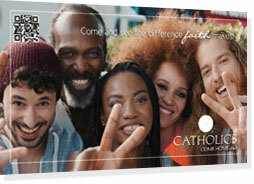 Get a pack of Millennial Evangelization cards for $5! CatholicsComeHome.com Evangelization cards are designed for you to share the CatholicsComeHome.com website and advertisements with today’s young generation. CatholicsComeHome.org door hangers featuring text from scenes from our popular “Epic” evangomercial. Extend a friendly, non-threatening invitation to your neighbors to come home to Mass. Perfect for individual evangelization or parish use. The front of the traditional door hanger reads: Sorry we missed you! We are family. Welcome home. Find your parish at CatholicsComeHome.org. Find your parish at CatholicsComeHome.org. The back of the door hangers are blank for your customization! Include a personal message, local parish address and website, Mass times or Confession schedules, etc. In a sample parish test (Oct 2016), CCH door hangers helped increase Mass attendance by 20 percent. CatholicsComeHome.com door hangers featuring text from scenes from our popular “Millennial” evangomercial. Extend a friendly, non-threatening invitation to your neighbors to come home to Mass. Perfect for individual evangelization or parish use. The front of the millennial door hanger reads: Sorry we missed you! We are family. EVERYONE is welcome home. Find your parish at CatholicsComeHome.com. Evangelize in traffic! Newly designed for longer lasting wear, our magnets can help you reach out to souls-in-need by displaying this CatholicsComeHome.org on your car – you never know whose life you may impact that is sitting in the car behind you! We ask for a $5 or more donation per magnet to cover our cost of printing and mailing. 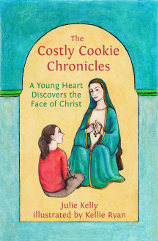 Nativity Press is pleased to announce the publication of its second book, The Costly Cookie Chronicles: A Young Heart Discovers the Face of Christ. Eleven-year old Clare wants to be a saint for Jesus, but there are a few things standing in her way: everything she says, does, and thinks. Well…not exactly, but almost. Clare finds surrendering her will to Jesus unbelievably hard, until a visiting priest shares an amazing secret during her church’s parish mission. In this second book by Julie Kelly, Clare discovers the tender love of Mary, the transforming power of meditating on the life of Jesus through the rosary, and the joy of contemplating with Mary the face of Christ. And in her delightfully candid way, Clare invites readers to walk the narrow road with her to Jesus through Mary.